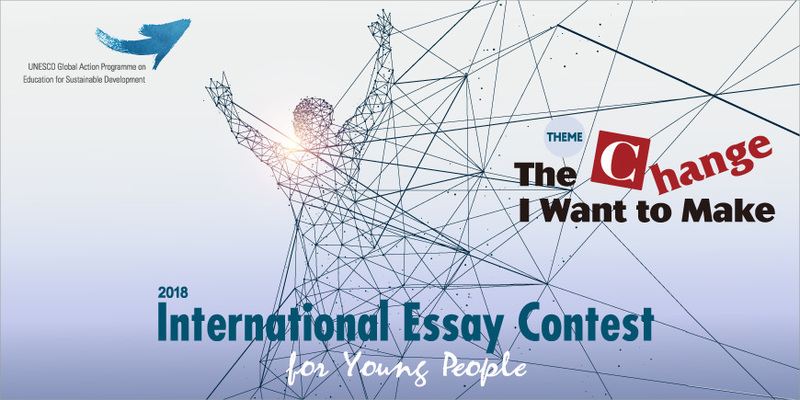 This annual essay contest is organized in an effort to harness the energy, creativity and initiative of the world's youth in promoting a culture of peace and sustainable development. It also aims to inspire society to learn from the young minds and to think about how each of us can make a difference in the world. What is the one thing you would like to change the most to make your school, workplace, community, country or the world a better place? How would you bring about that change? Please share your concrete ideas. 2. Essays must be 700 words or less in English, French, Spanish or German, or 1600 characters or less in Japanese, excluding essay title and cover page. Essays may be typed or printed. 3. Entries may be submitted by postal mail or online. * IMPORTANT: To send your essay online, you must go to the online registration page and follow the required steps. (1) category (Children or Youth) (2) your essay title (3) your name (4) address (5) phone number (6) e-mail (7) nationality (8) age as of June 15, 2018 (9) gender (10) school name (if applicable) (11) word count. Teachers and youth directors may submit a collection of essays from their class or group. Please enclose a list of participants' names, ages and the name and contact information of the submitting teacher or director. * We are unable to confirm receipt of essays. 5. Essays must be original and unpublished. Plagiarized entries will be rejected. 6. Essays must be written by one person. Co-authored essays are not accepted. If you have questions, please consult the FAQ section below. Entries must be received by June 15, 2018 (23:59 your local time). * Additional awards (Recognition for Effort, Best School Award, School Incentive Award) will be given if applicable. * All prize winners will be announced on October 31, 2018 (Japan time) on this website. Certificates and gifts will be mailed to the winners in December 2018. * We are unable to answer individual inquiries concerning contest results.